* Please note that our retreats book out quickly, so do register early. We are unable to take bookings or expressions of interest prior to notification. * We are involved in supporting scientific research into the effects of meditation. If you'd like to be involved, our current projects are detailed at the bottom of this page. Please Note: retreats may not be suitable for those who have experienced psychosis or who are currently experiencing PTSD, acute depression or anxiety. If in doubt, please seek advice from a psychologist or psychiatrist and speak to our Retreats Manager before booking your place. A key part of the Buddhist path is developing and cultivating the sure heart’s release. We’ll look at cultivating different expressions of love, and working with what gets in the way. This path of awakening leads us towards the wisdom of how to more fully inhabit our lives and how to belong and claim our rightful place in the world. As our understanding of what get's in the way of loving deepens, we naturally learn how to care for our whole selves, and how to live life with a wiser and undefended heart. An undefended heart does not mean being totally undefended and open to any attacks that may happen, rather it's about learning to trust our ability to be strong enough to deal with whatever happens with kindness. Protective love is as equally valued as sweet open connection. Having clear boundaries in life gives us the option to say "Yes" when we mean "Yes" and also to give a clear "No" when needed. A clear "No" can support a clear "Yes" and help a part of us relax. 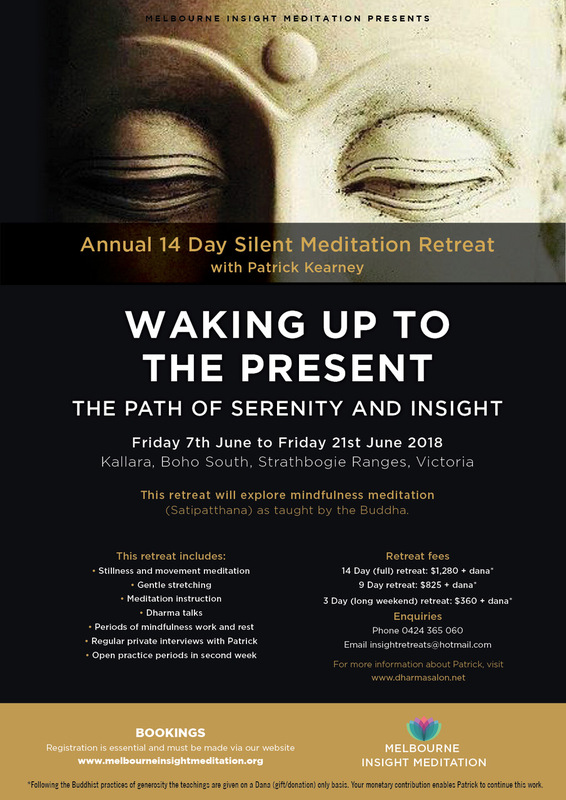 Exploring classical and contemporary teachings of Insight Meditation, (Vipassana) this retreat is suitable for beginners and experienced meditators. There will be ongoing opportunities to ask questions and receive individual meditation guidance. Daily there will be group meditation instructions, guided meditations, talks, walking, chanting, sitting meditation and a yoga and/or qigong period. While we do give meditation instructions to the group, we consider it important that there are times for 1-1 interviews with the teachers throughout the day where you can explore on a more private and personalised level, what is happening for you. Shared room - $390 + dana for Anton's teaching. Single room - $530 + dana for Anton's teaching. meditation or you are wishing to deepen your understanding. The afternoon will include guided sitting meditations, walking meditation, a dharma talk and an opportunity for questions. This retreat will explore mindfulness meditation (satipatthana) as taught by the Buddha. It will provide an opportunity for beginners to become firmly established in their practice, and for experienced students to deepen their practical and theoretical understanding. The practice will cover mindfulness of body, mind and emotions, and explore the possibilities of transformation in the way we live our daily lives. Patrick has been practising Buddhist meditation since 1976 and teaching full-time since 2000. He teaches in the lineage of Mahasi Sayadaw of Burma. His principal teachers have been Panditarama Sayadaw and John Hale. He has also practised Zen, in the Diamond Sangha lineage. His principal teachers have been Robert Aitken Roshi and Paul Maloney Roshi. 14 day - $1280 + dana for Patrick's teaching. Click here to book. 9 day - $825 + dana for Patrick's teaching. Click here to book. 3 day (long weekend) - $360 + dana for Patrick's teaching. Click here to book. This retreat will be open for bookings in May 2019. This retreat will be open for bookings in July 2019. ​Would you like to participate in a Research Study? MIM is currently supporting a research study on the effect of meditation on the brain. If you'd like to be involved please contact the Researcher directly.